Released in 2003, House of a 1000 Corpses had actually been sitting on a shelf since it had been made in 2000. Studios were reluctant to release it as they were unsure of the rating it would receive from the film board. Corpses marks Rob Zombies directorial debut, he also wrote the film, and for a first attempt, Zombie pretty much knocked it right out of the park. The cast of Corpses is a good one. Sid Haig (as Captain Spaulding), Sherri Moon (as Baby Firefly, Moon would later marry Zombie effectively giving her the more bizarre name of Sherri Moon Zombie), Karen Black (as Mother Firefly), Bill Moseley (as Otis Firefly), Michael J. Pollard (in a tiny cameo as Stucky), William Bassett (as Sheriff Frank Huston) and Dennis Fimple in what would be his last film role as Grandpa Hugo. Rob Zombies first horror film would be the celluloid equivalent to his Heavy Metal music. Zombie is an avid horror film fan himself, he adores horror films from the 1930’s and 40’s, he had already directed all his own music videos when he decided to make a feature length film. Although the film opens with two couples who are travelling the back roads of rural America in search of local legends and places of infamous origins for a ‘travelogue’ the film is really about the Firefly family. Captain Spaulding, who dresses like a clown, is the head of the backwoods brood. The Firefly’s are like the American dysfunctional family on acid. Every member of the family give a whole new meaning to the descriptive word eccentric. Spaulding is at turns, funny, irascible, and murderous. Mother Firefly is a southern belle of a gal, who can be likened to Blanche Dubois on drugs. Baby is drop dead gorgeous (emphasis on the drop dead), Otis is the most visually terrifying of the family, he lacks either the skill or the need to hide his murderous nature. The two couples, a hilarious quartet of young people whose delight at discovering the existence of Dr Satan, are at turns excited (the boys) and disgusted (the girls). When they get directions to the tree where Dr Satan was hung, they get lost and they get a flat tyre. It is when they ‘break down’ that they come across the Firefly clan. They are welcomed into the Firefly home and are entertained while their car is being repaired. The scenes in the Firefly home are ingenious. Baby Firefly has a definite interest in Bill Hudley (Rainn Wilson) and his girl friend Mary Knowles (Jennifer Jostyn) is less than pleased at this. At dinner, where they all have to don masks (“If ya don’t, she won’t serve desert!” says Grandpa Hugo), they hear how Mother Firefly’s ex-husband tried to burn down their house while Tiny (Matthew McGrory) was sleeping in it. After dinner the family then put on a show. It is “Theatre Firefly” and Baby comes out singing I Want to be Loved by You to Bill. Mary doesn’t like this one little bit. She threatens Baby and the whole evening turns deadly. 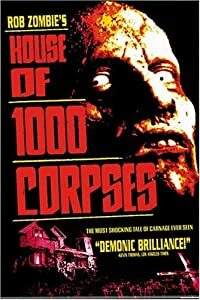 If it were not for the incredibly vicious violence, House of a 1000 Corpses could almost be a comedy. Any scene with Sid Haig as Spaulding is hilarious. He is broadly funny and antagonistic. His interaction with Bill Hudley and later with the two deputies left me gasping for breath. His scenes are comedic to the extreme. The Firefly evening, felt so surreal. We feel as awkward and as uncomfortable as the young couples obviously do in the house. Mother Firefly is clearly mad as a hatter and the fact the both Bill and Jerry Goldsmith ( Chris Hardwick) both fail to notice this, is both funny and ominous. The film is an almost perfect ensemble piece. The entire family each get a chance to show off their backwater weirdness and both Otis and Baby are terrifying. Otis with his clearly evil ideology and Baby with her childish and naive murderous nature both shine a bit more than the rest of the family. Of course the iconic Karen Black as mother was brilliant. It is a shame that a dispute over salary kept her from reprising her role in the sequel The Devil’s Rejects. Corpses was Rob Zombies initiation into the world of horror and he followed it up with The Devil’s Rejects or as I like to think of it The Further Adventures of the Firefly’s. He did hop on the re-make train and he re-imaged the classic Slasher Horror that is Halloween, part one and two. He is currently working on The Lords of Satan. Zombie is continually fine tuning his directing talent but he still makes what I like to think of as heavy metal horror films. I cannot wait to see what he has in store for us with his next film.